Congrats Lalatidah on completing a goal. I also completed the 5k walk a little over a week ago and I started the 10k walk. You just have to set your mind to do it and use whatever works for you. I walk and use my mp3 and listen to gospel and oldies. Keep up the good work. You can do it. I'm not sure if I was supposed to click "Reply" or "Start a New Topic".. seems I always choose the wrong one... but, anyway... I'm here!! I'll be starting this program tomorrow. 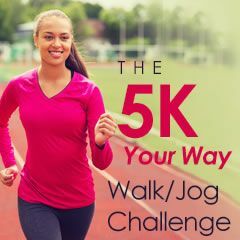 I finished the 5K Your Way Walking program last week. I've never been a jogger/runner - EVER!! But since I started walking on the treadmill at the gym a few months ago, and once I got comfortable, I added a few minutes of jogging here and there. I found it quite hard to do, but I kept trying. I never in a gazillion years thought I would ever WANT to jog! That motivation led me to researching here on SP programs to follow to help me achieve a goal and feel good about completing something. So, here I am... one program down and about to start another!! I am really excited that I feel I CAN do this... I was amazed at how easy the Walking program was! What's my secret? My iPad Mini!! I downloaded books to read while on the treadmill. I love to read, but unable to sit for any length of time to read due to the gazillion things that need to be done at home, but what else is there to do for an hour on the treadmill? I just hope I'll be able to read while doing this program... it'll be a lil more difficult because I'll be clock watching... but I'm determined to do it!! !